Add a cool splash of color to any wardrobe with abalone jewelry Ultra chic necklace features Shiva Eye abalone shell Teardrop pendant. The Pendant hangs from fashionable Black Beaded Necklace. 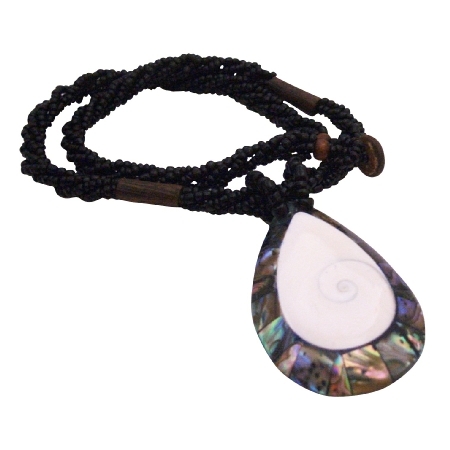 This gleaming necklace features a shiny pendant crafted of a colorful Abalone shell with Shiva Round Eye. A perfect present that she will surely love. Which is really unique style. This necklace was professional hand strung each Black bead. Super Grade RARE HIGHEST QUALITY. Quality A to AA. It is the traditional Jewelry.This necklace is very popular gift for someone you love or special. Good shinning surface quality.